On a recent dive trip we took some time off to do some snorkeling in Key West and came across a dive shop renting out these interesting looking contraptions. We had stumbled across the first full face snorkel mask on the market. The cool design caught our eye instantly, resembling a full face dive mask, or something you would see in a Sci-fi film. We decided to rent a couple and test them out, not having seen much online about them. So how did they stack up when compared to traditional snorkel gear? Snorkeling in key west is one of the major tourist activities and is fun for people of all ages who may not be certified divers. One objection some people have is they do not like submerging their face in the water, even with a mask and snorkel. 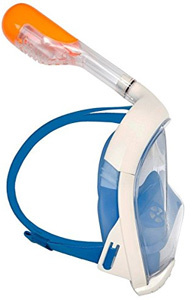 The cool thing about this mask is that it keeps your face completely dry and you don’t have to worry about choking on water should water somehow make its way into the fantastic dry snorkel. No one likes taking a mouthful of salty ocean water. If by some chance water makes its way into the mask, it simply runs down the front lens and collects into the chin area to be purged automatically the next time you exhale. This is great for avoiding panic if you or your kids are not the most confident ocean explorers. One of our friends hates swimming in the ocean and he had a ton of fun once we convinced him to give it a shot. Let’s talk about the lens. It’s HUGE! Providing you with a great field of view with peripheral vision as opposed to most standard snorkel masks. We really enjoyed seeing more of the amazing sights the ocean has to offer during our time snorkeling in Key West! The overall construction of the easybreath felt nice and durable. In terms of comfort, none of us experienced any issues once we figured out how to adjust the mask for a water tight seal. The wide straps are a bit different from the average scuba mask, but being a full face snorkel mask it is important to evenly spread the pressure around your head to keep an even seal and avoid leaks. And because you don’t have a snorkel stuffed in your mouth the entire time, there is no lip or jaw fatigue, and you can breathe normally through your mouth or nose. This is the main draw when compared to regular style snorkeling gear, the comfort that comes inherently with the design. This mask is great for anyone who likes to take pictures while snorkeling, the wide field of view makes it super easy to have a clear view of your environment and easily see your viewfinder or LCD camera screen. So who wouldn’t enjoy this mask? Anyone who likes to free dive and dip below surface level on a regular basis. It is possible to do, but because you essentially have a sealed bubble strapped to your head, it is rather buoyant. 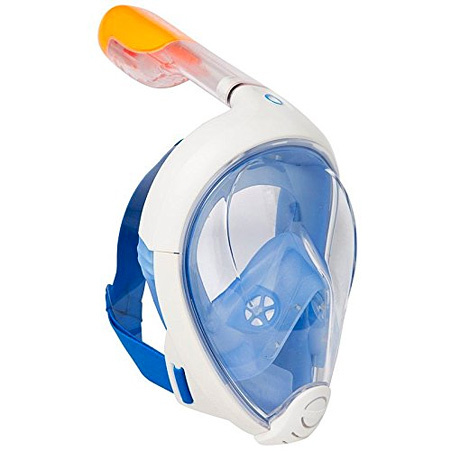 This full face snorkeling mask was clearly designed for those who like to swim on the surface and enjoy the aquatic action below them. Anyone with facial hair will know it can cause annoying leaks in your scuba/snorkel mask and that is another side benefit of using a full face snorkel mask. Because it seals around your head and not the upper lip area there was zero issues with leaks for our bearded members of the group. There was surprisingly also no issues with fogging, which we were expecting given the fact you breathe directly into the mask. We are not sure what voodoo magic TriBord was channeling when they designed the EasyBreath snorkeling mask but it worked. Our team went from being skeptical to fully sold on this full face snorkeling mask idea instead of our traditional snorkel gear. In fact, we even ordered a couple when we got back for any upcoming shallow photography trips. We would definitely recommend this to families looking to do some snorkeling in Key West or anywhere around the globe! Just grab yourself a pair of snorkel fins and you are good to go! This unique looking full face snorkel mask surprised us during our time snorkeling in key west. The interesting design makes surface snorkeling easy for anyone and keeping your face dry during your adventures is great for those not 100% comfortable in the ocean. Being comfortable in the water is what counts and if you are not a fan of traditional snorkeling gear this this could be a great fit for you.